Today’s episode was recorded at the Personal Robots Group at the MIT Media Lab in the middle of some beautifully expressive robots such as the Huggable, Tofu and Leonardo. There, we had a chance to speak with Sonia Chernova about the Mars Escape online game that is being used to learn about how humans and robots can work in teams. We then speak with Kenton Williams about the technical aspects behind one of their most expressive robots, Nexi. 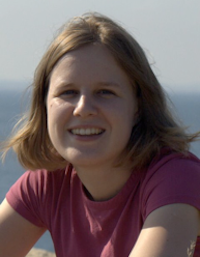 Sonia Chernova received her PhD from CMU, where she worked with Manuela Veloso (see Robots interview). She is now working as a post-doc at the Personal Robots Group at the MIT Media Lab , directed by Cynthia Breazeal (see Talking Robots interview). At MIT, she’s looking at how to create robots that are able to assist and work with humans in a natural, predictable and robust way by gathering data through a new online game dubbed Mars Escape in a world premiere at using the Internet to study human-robot interactions. Anyone can participate in this experiment by taking on the role of a robot or an astronaut in an attempt to escape from their oxygen-deprived Mars-base without leaving anything important behind. Give it a try! Using the data from thousands of players, Chernova will look at how to use the dialogs and actions performed online to generate a computational behavior model for each player. This model will then be tested online and then implemented in the Nexi Robot in a physical replica of the Mars Escape game that will be set-up in the Boston Museum of Science. Finally, Chernova will be joining Worcester Polytechnic Institute as an Assistant Professor of Robotics Engineering in the fall of 2010. Kenton Williams is expert in the bolts and nuts of Nexi. As a Mechanical Engineer, he will be telling us about the technical aspects and challenges behind the robot and his thesis on making Nexi learn physics! For more information on this episode’s news, including videos of Anybots’ and Willow Garage’s telepresence robots and more information on Microsoft’s surprising move, visit the Robots Forum.